The Piranha hydraulic press brake is a piece of metal fabrication machinery that performs bending procedures on flat, sheet metal work pieces. Typically used to bend sheet metal, a press brake can be used for all types of sheet and plate material. It forms predetermined bends by clamping the work piece between a matching punch and die. 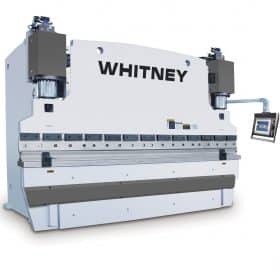 The bending process consists of V-shaped opening that form the sides of the press brake, connected to a table at the bottom and on a movable beam at the top. A wedge-shaped tool (punch) presses the work piece into the v-opening and thus bends it to the desired angle. Piranha Precision Press Brakes have perfected this art with a super-accurate ram that is capable of precise tolerances of ± 0.00004″. The brands of Piranha and Whitney represent the core values of MegaFab. 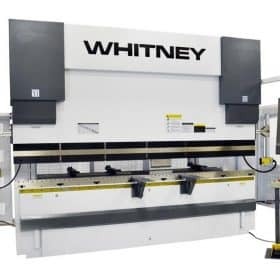 The Whitney Press Brake has been reborn as the Piranha Precision Press Brakes. Piranha Press Brakes are an essential component of metal and fabrication shops. Piranha is a trusted brand loaded with solid features that continue to add value. These high-performance precision press brakes are electro/hydraulic systems delivering superb accuracy. Piranha Precision press brakes maintain bending accuracy even while processing materials that vary in type, thickness and grain direction. Metal Fabrication Shops that process thin sheet metal will benefit from Piranha’s automated process, precise bending accuracy and ease of use. Medium and thick sheets of metal or plate material will realize Piranha’s benefits in consistent angle accuracy, fewer trial bends, and easy to adjust angles that allow for simple tool changes during operation. The Piranha Press Brake WPA Series single or tandem machines produce a bending force from 40 Tons to 90 Tons. The WPA Series is also equipped with a color touchscreem, the Delem DA-56, is the standard control allowing easy operation and manual intervention. A Hoerbiger hydra system featuring a closed loop proportional control backgauge is a standard feature. Two bolted front sheet supports are included and can be moved or bolted down across the length of the machine. The Piranha Press Brake WPB Large Tonnage Series single or tandem machines produce a bending force from 440 Tons to 3000 Tons. The WPB Large Tonnage Series is designed for heavy duty large applications. Piranha series includes an electro-hydraulic full loop servo system that controls the synchronization of the ram. Along with cylinders that are attached to the ram with spherical floating supports while the piston and rod is equipped with a unique guiding system to assist during unbalanced loading. The Piranha Press Brake WPH Series single or tandem machines produce a bending force from 90 Tons to 335 Tons. Also equipped with a dual gibbed ram structure and an automatic self–lubrication system, this guarantees precise operation every time. 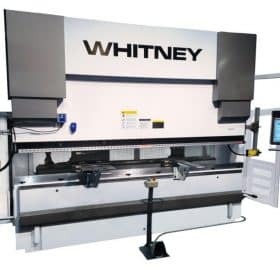 The Piranha Integrated Hydraulic Bed Crowning is standard on all models and the CNC hydraulic crowning system is equipped with a 3 piece bed design and a c-frame throat deformation compensation system that ensures precise bends everytime. Piranha hydraulic press brakes combine affordable precision, speed, and durability for years of solid performance.